This occurred to me while watching the swift collapse of self-avowed not-a-racist Tom Kawczynski, whose hobby was building a white ethno state in northern New England when he wasn’t too busy running the town office in Jackman. The “New Albion” project became Kawczynski’s full-time gig Tuesday, after the selectmen found out about his advocacy for racial separation (like what they used to call “apartheid” in South Africa) and his theories on banning Islam because the religion is “not compatible with Western culture,” (except for the part of Western culture that celebrates religious freedom). Kawczynski made two claims in his own defense: He was simply exercising his First Amendment right to free speech. And he’s not a racist. Maybe nobody. Remember when Gov. 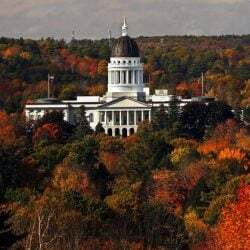 LePage flew into a rage when he (mistakenly) thought state Rep. Drew Gattine had called him a racist?